The Expedition Kit has lived up to its name time and time again, on major expeditions to Mt. Everest, Antarctica, Pakistan, India and Peru. For large groups of people traveling to remote locations anywhere in the world. 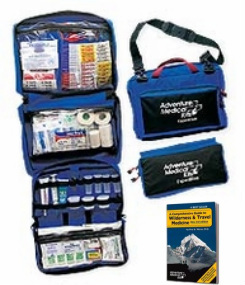 This kit has all that you need with room to add your personal medications in the detachable inner bag. First developed for Mountain Travel-Sobek and Adventures guides. Size: 15" x 9" x 7"